President Donald Trump made the statement that the United States is withdrawing from the Paris Climate Accord, in the Rose Garden of the White House, On Thursday, June 1, 2017. As President Donald Trump on Thursday pulled the U.S. out of the Paris climate accord, several healthcare executives vowed to continue their environmental stewardship efforts—with or without White House support. Under the climate agreement, the U.S. agreed to reduce its greenhouse gas emissions by as much as 28% below 2005 levels by 2025. But Trump withdrew the country's participation in the nonbinding agreement Thursday, saying it left the U.S. at an economic disadvantage because it and other wealthier nations would fund climate actions in developing countries. Health conditions related to climate change are estimated to have cost the healthcare system $14 billion a year between 2002 and 2009, according to a study published in Health Affairs. 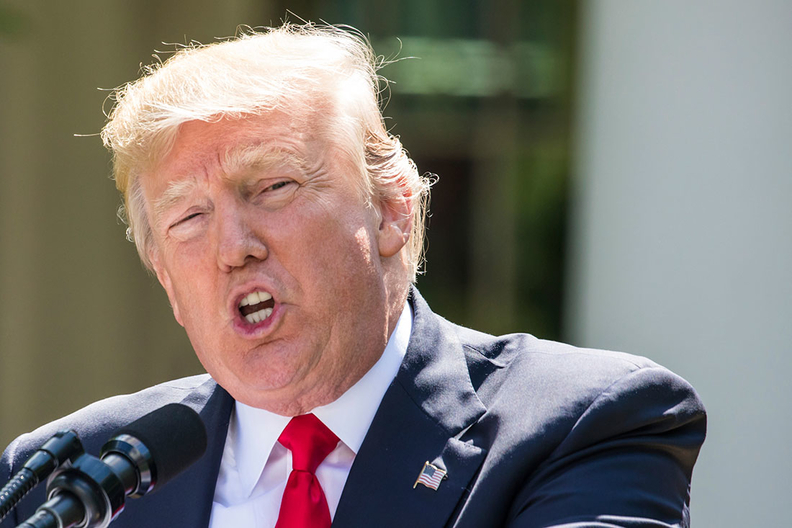 Public health advocates and healthcare providers have roundly criticized Trump's decision, saying the withdrawal from the agreement ignores growing evidence of the short- and long-term health effects of climate change. "We supported the Paris climate agreement and are disappointed by President Trump's decision to withdraw our nation from this important global initiative," said Dr. Gary Kaplan, chairman and CEO of Seattle-based Virginia Mason Health System, in a written response. "Recognizing that climate change is a significant threat to human health, Virginia Mason will continue to pursue a path of providing quality healthcare in such a way that it protects individual, community and global health." Virginia Mason is among a growing number of health systems throughout the country that have taken steps toward addressing climate change within their own facilities, including sustainability initiatives such as reducing landfill waste and water conservation to sourcing food from local producers. In a statement, Kaiser Permanente Chairman and CEO Bernard Tyson reaffirmed his system's commitment to reducing its carbon footprint. Last year, Kaiser set a goal of removing more greenhouse gases from the atmosphere than it emits by 2025. "We must stand up for cleaner air and water in order to improve health," Tyson said. Poor air quality stemming from climate change can exacerbate chronic conditions such as asthma, which affects 25 million Americans and was responsible for $56 billion in medical costs and lost school and work days in 2007, according to the Centers for Disease Control and Prevention. "Healthcare is the one sector that has healing as its mission," said Gary Cohen, president and co-founder of the advocacy group Health Care Without Harm. "Healthcare has the potential to help lead the way for our energy future and change the narrative about addressing climate change to one that's focused on health of the people and health of the planet." Many providers are mindful of such costs as they move from traditional fee-for-service payment models to ones where they take on more risk. "When you consider the impact poor air quality has on the people we are taking care of in our communities, we want to ensure that we are not making the quality of care for the folks who live in our communities worse," said Tonya Wells, vice president of federal public policy and advocacy for Michigan-based Trinity Health. Wells said she was disappointed by Trump's decision to withdraw from the Paris agreement but said it would not deter Trinity from its mission to address climate change, a position shared by other health systems. "The bigger picture is that we're pressing on," said David Vitka, vice president of facility planning, design, construction and properties at Catholic Health System in Buffalo, N.Y. "I would to hate to think that some healthcare providers would see a way out now of their responsibility."